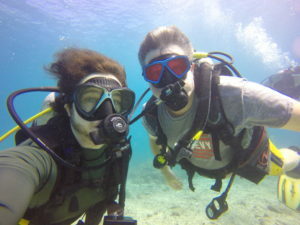 Robby Glass goes diving in the Northern Mariana Islands where he practices law as an Assistant AG. When Jonathan Robert “Robby” Glass Jr. graduated from the St. Mary’s University School of Law in 2012, the last place he thought he would end up was on an island in the middle of the Pacific Ocean. Today, Glass finds himself moving seamlessly between practicing law and developing a community’s legal system. Thankfully, he can wear sandals to work — just not in court. “We have the opportunity to address legal questions in an effort to make the islands better for generations to come,” Glass said. Glass said he “never intended to be working in criminal law.” Yet he now fully appreciates the lessons he learned in his criminal law course and the topics discussed in the federal criminal procedure course while at law school. After working for three years as an assistant district attorney in Huntsville, Glass packed up and moved to Saipan, the largest island of the Mariana Archipelago, where he’s served as an assistant attorney general for the past two years. Established in 1977, the Commonwealth of the Northern Mariana Islands includes 15 islands. Due to the Commonwealth’s relatively young age, Glass has a unique vantage point from which to practice law and to observe how a region develops and establishes its own case law. Glass recalled few opportunities to affect such change during his time working in Texas, with its firmly established case law and legal precedent. In just two years on the islands — in between taking full advantage of the island’s natural offerings — Glass has appeared many times before the Supreme Court of the Commonwealth of the Northern Mariana Islands to argue the government’s position. Through his legal work, Glass also has firsthand experience in understanding the importance of reconciling different cultures and perspectives. “It is important to understand the culture in which you practice the law. You have to really look at and understand the community environment to be an effective prosecutor,” Glass said.